Axial R/C Inc. is pleased to announce MAGNAFLOW as a continued sponsor for AXIALFEST 2017! MAGNAFLOW has been an official technical partner of Axial since the introduction of the AX90028 Axial SCX10™ 2012 Jeep® Wrangler Unlimited Rubicon 1/10th Scale Electric 4WD – RTR. Axial R/C Inc. is pleased to announce RCP Crawlers as an attending sponsor for AXIALFEST 2017! 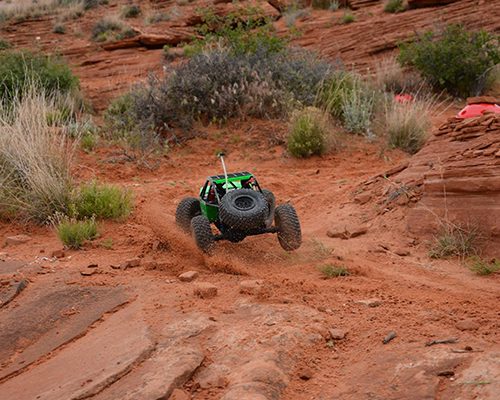 Since the dawn of crawling … RCP has been a world leader in crawler innovation. From the steel lockers to the curved skidplate, from the Hustler chassis to the carbon fiber wheels, RCP Crawlers has been part of the crawler revolution. We believe each build is unique whether you’re building a scaler, competition rig or a rock racer, there’s always something that makes it your own. We work with the best vendors in the business so we can provide you with quality parts and accessories for all your building needs. Not only are we a business committed to offering unsurpassed customer service and support, we also use and compete with the products we sell. We are proud to be a participating sponsor of AXIALFEST 2017! Axial R/C Inc is pleased to announce Starkeys Food Truck as a second year food vendor for AXIALFEST 2017! Dave Starkey has worked in kitchens for over 25 years. Originally from Baltimore, Maryland Dave graduated from the Culinary Institute and shortly after worked in & ran some of Baltimore’s most prestigious kitchens. He has lived in the Lake Tahoe area since 1998. Most recently Dave was the lead sushi chef at Dragonfly Cuisine in downtown Truckee for 7 years. He is married with two young children and resides in Truckee, CA. 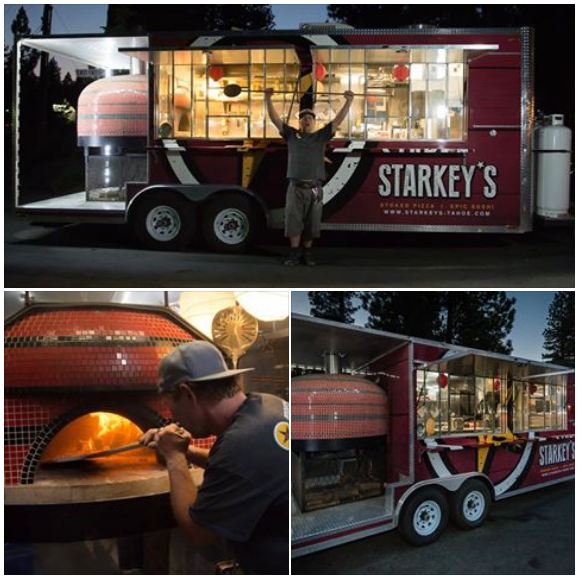 Chef Dave Starkey is introduced Tahoe’s first mobile, wood burning oven and sushi restaurant on wheels. Starkey wants to present locals and visitors with a new model for getting unbelievable pizza and sushi at a great price. The key to our model? Bringing the restaurant straight to you. Starkey’s is also available for catering & private parties. Open 6 days a week with wood oven pizza made from scratch and Starkey creations. Also bringing Starkey’s famous sushi and Japanese flavors. 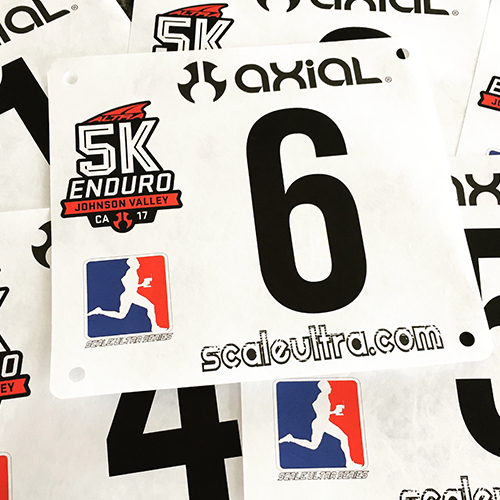 After a successful Altra Ultra 5k Enduro at the 2016 Axialfest, the Scale Ultra Race Series was born and took the budding new race format on the road. 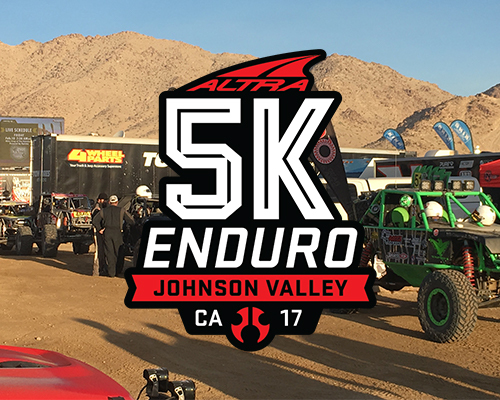 The two founding partners were back with Altra Footwear as the title sponsor of the series and Axial as the presenting series sponsor. Camelbak Hydration and SOR Racing also joined the sponsor list providing awesome podium and raffle prizes to make the series that much sweeter. With Axial as the host and the famous Johnson Valley as the landscape, event #1 headed to SoCal to share the course and the weekend with the race that inspired the creation of the Ultra 5k, King of the Hammers! 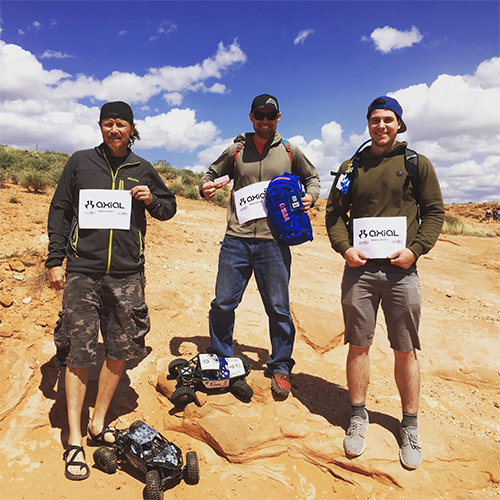 Axial goes all out the week of KOH and after days of watching full and scale sized rock racing, the Scale Ultra drivers took to the scene to race the historic course. 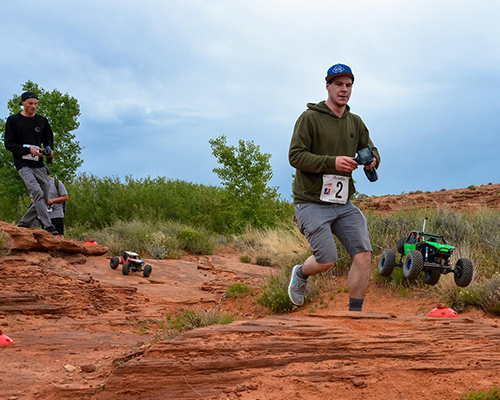 The KOH course was a perfect blend of speed and tech with wide open straights (on the same berms that the full size racers had ripped just hours before), sandy sections and a techy rock section that required constant attention. 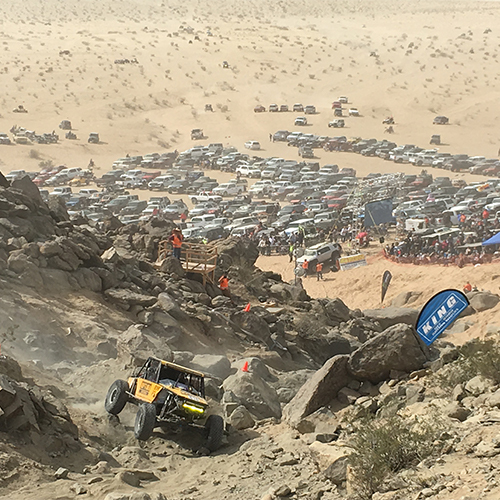 In true KOH style, the different sections stood alone and you could go as fast as your legs and your lungs could handle in the open sections with the rocky section slowing the flow and creating some exciting passes and tense “rubbing” and “racing”. 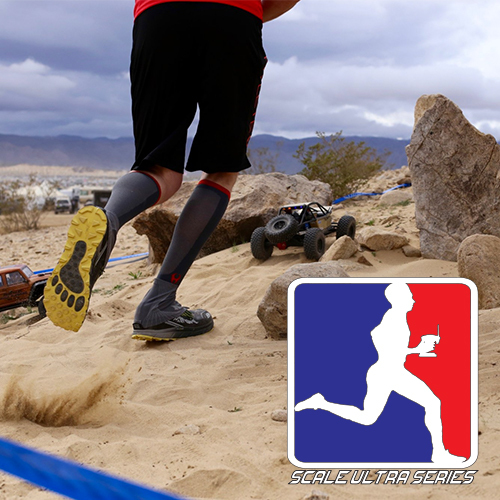 Runners/Drivers came from all over California, Nevada and Utah to compete in stop #1 of the new ScaleUltra series and the action did not disappoint. Some familiar faces were in attendance with Axialfest Altra Hot Lap winner Jake Wright putting in some fast laps right from the start and was in the podium mix until a last lap mechanical stopped his efforts. An impressive showing, especially with the then unknown broken collarbone and shoulder injury he suffered after cartwheeling as co-driver in the full size race the day before. Axialfest 3rd place finisher, Casey Currie, came out to scope the scene but after an exhausting week of racing both UTV and Unlimited class, he opted to cheer on the action vs grabbing a remote. 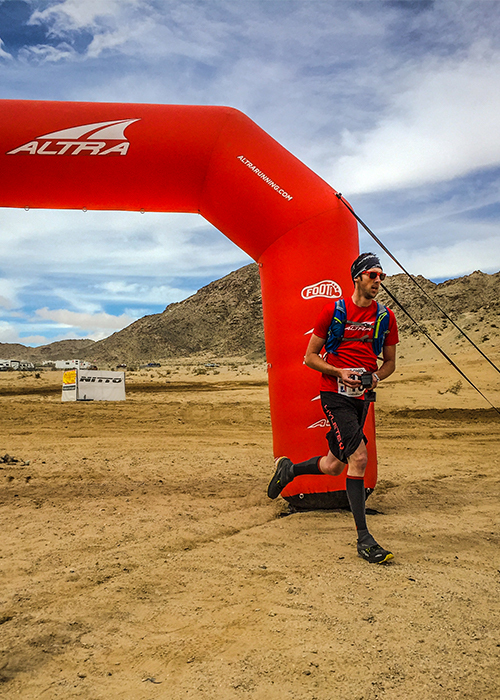 Altra Running’s Chris Jones was in attendance as well and set a blistering first lap time taking the Altra Hot Lap and the overall win. 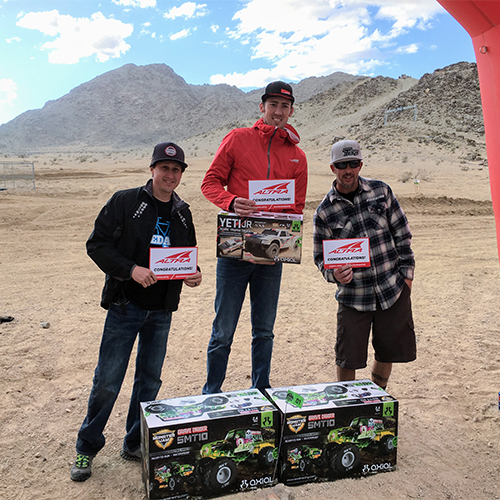 The Axial Bomber was the rig of choice again this stop taking the majority of the fastest lap times but some built SCX10II rigs stole a spot on the podium and were in the mix throughout the event. 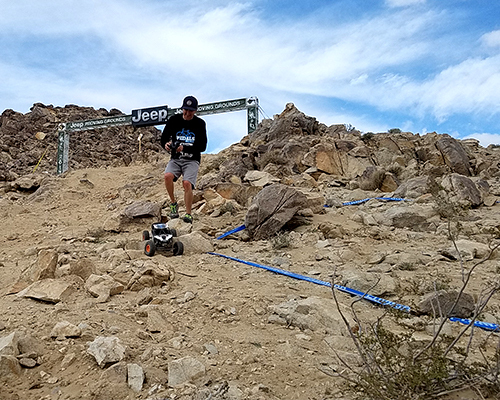 Axial has been a major sponsor of the King of the Hammers over the years and we foresee the Ultra 5k continuing to be a part of Axial’s KOH efforts into the future. 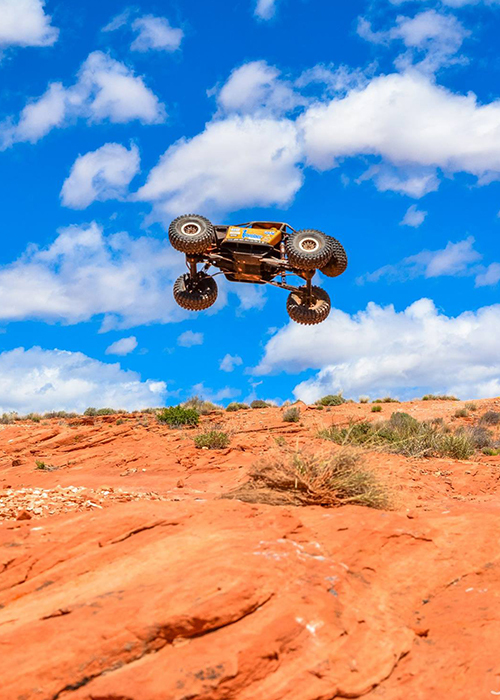 Sand Hollow State Park just outside of St. George Utah is one of the better rock crawling locations you may have never heard of. On any given weekend you may see a trail run lead by the Dixie 4X4 crew or even stumble upon a full on W.E. Rock comp taking advantage of the famous Utah red slick rock. 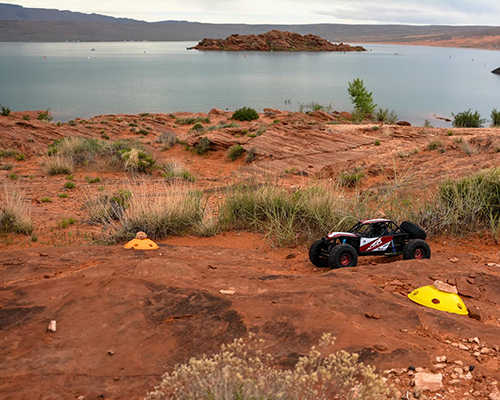 This backdrop was the site for round 2 of the Scale Ultra series and ran on the edge of the Lake Powell-esque reservoir. 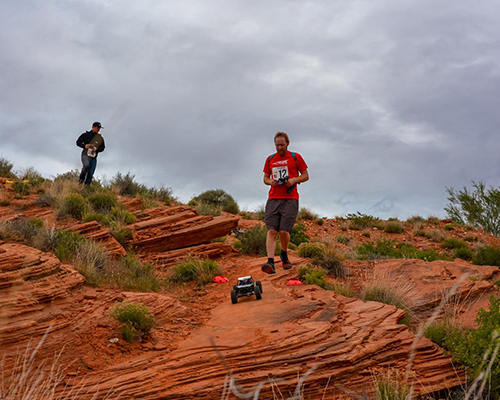 A perfect blend of all out speed fire roads, technical slick rock sections and power sapping red sand tried drivers fitness and ability as they maneuvered around this high speed course for multiple laps. 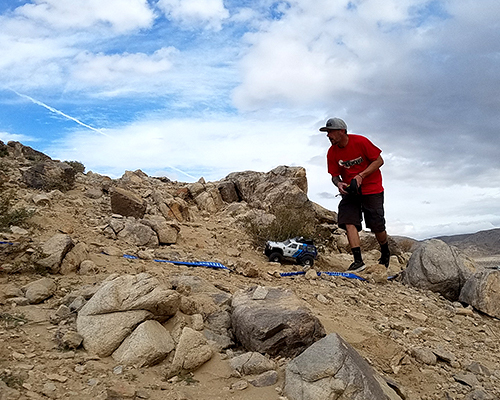 Race Host and Scale Ultra Series founder Chris Jones, left the course wide for “personal interpretation” with multiple riders opting for the less safe but much more thrilling “just send it” line options. This resulted in several rigs spending almost as much time in the air as on the ground. 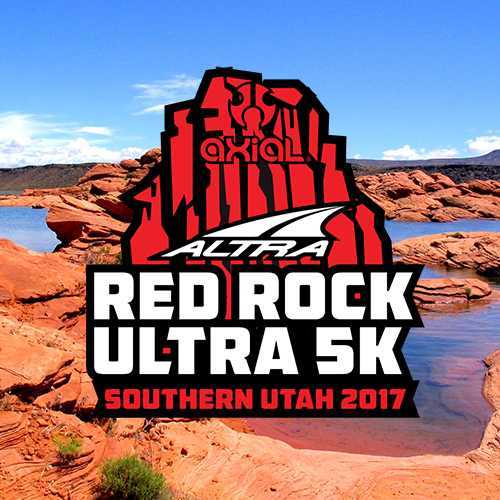 The field of talent for the Red Rock 5k was 2nd only to the Altra Ultra Enduro at AXIALFEST2016 with several of the normal characters making the trip out. The 801RC boys in the Salt Lake area do these longer Ultra style events quite often and quickly showed they came to play putting two on the podium and filling the top 10. The 2nd place finisher from AXIALFEST2016, Mike Thompson, debuted his new Altra-Spec Bomber, just finished up hours before race start. He had a strong finish in the top 10, further proving the difficulty of both the course and the speed of the competitors. The Axial Bomber showed once again it was made for this style of racing taking the entire podium and the majority of the top 10 spots. The creativity and different builds were fun to see as these pure race machines ripped around the slick rock paradise. When the dust settled and heart rates hit their max it was Jake Wright who ended the day with the win. 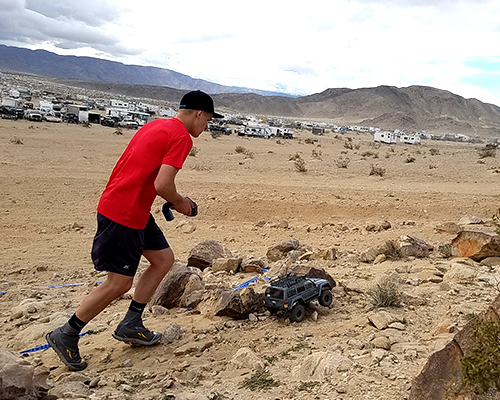 After a string of mechanical’s kept him off the podium in events past, Jake could not be stopped on this day with the Altra Running / ScaleUltra.com Offroad Team driver finishing with the fastest lap and the overall victory. While the R/C might be scale, the physical is full size! for AXIALFEST 2017! 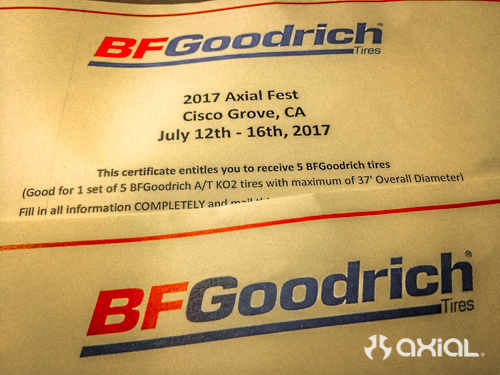 BFGoodrich Tires has been an official technical partner of Axial since the introduction of the AX90028 Axial SCX10™ 2012 Jeep® Wrangler Unlimited Rubicon 1/10th Scale Electric 4WD – RTR. With 115 years of innovation, BFGoodrich makes tires for people who want more fun from their vehicles — just like we do. If you have a passion for driving, you’re one of us. Our tires are engineered by people who spend their weekends off-roading or at track day events. And they’re proven to win in racing competition from Baja to Sebring. They bring out the performance in racing vehicles and vehicles just like yours. 20 Consecutive SCORE Baja 1000 Wins! 17 X-Games Super Rally Medals! 5 Decades of racing in the top series on and off-road all while delivering the first ever 1g lateral acceleration by a street tire! To help you prepare for Axialfest 2017, Altra is offering an exclusive code to Axialfest attendees. Use the code: AxialAltra20 on www.altrarunning.com to snag some comfy new kicks for the trail. 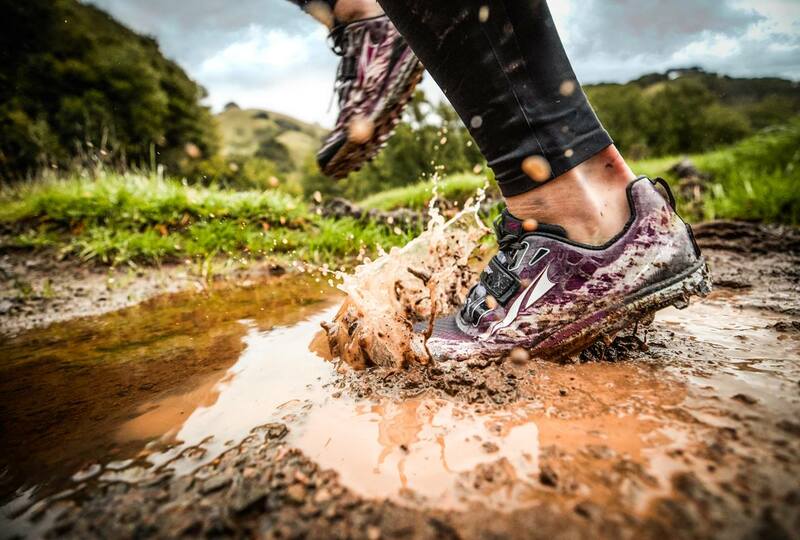 Altra trail shoes are the perfect blend of comfort and traction for long days on the trails. Whether hiking, running or a mixture of the two, Altra has the shoe for you. Inspired by our Mountains, built and ready to take on your World. Axial is super stoked to announce that Kona Bikes on behalf of our favorite bike shop, Pedals Bike Shop of Riverside, CA is donating a 2017 Kona Big Kahuna 27.5+ bike to the massive raffle pile! 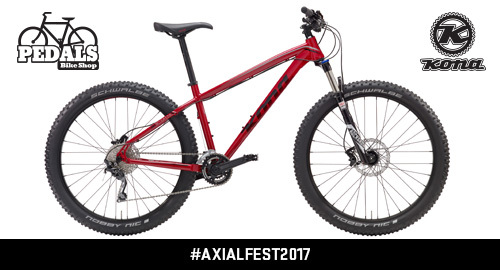 This Kona Big Kahuna will be given to a lucky raffle ticket winner during the AXIALFEST2017 Awards Ceremony! How do you get your raffle ticket? Show up to the Awards Ceremony! The Kona Big Kahuna is where the rubber meets the trail. The Big Kahuna, with a 27.5-inch-plus tire and playful geometry, makes as much contact with the dirt as possible. The entire Kahuna line is already known as a worthy singletrack shredder, and by giving this bike a bigger footprint, Kona has made it more capable than ever. At Kona, we’re all about the freedom and empowerment of the bicycle. We have been since 1988. We still have the same founding owners. We’re still populated by a staff of keen, active, impassioned cyclists. We’re not big, nor are we that small. Just a dedicated group of cyclists making bicycles for people who love bikes-no matter if that love is new or long established. 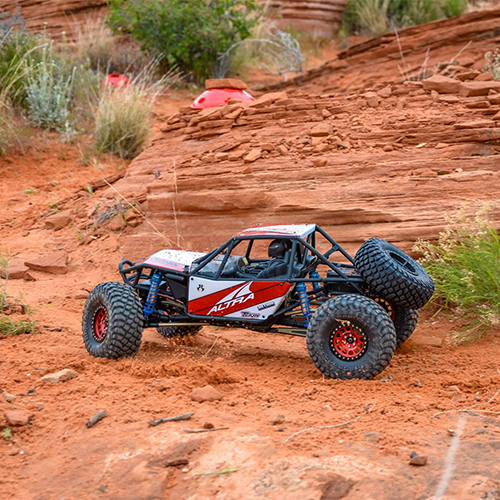 Axial RC Inc. is proud to announce AZU4RC as a first time sponsor and attendee supporting AXIALFEST2017! 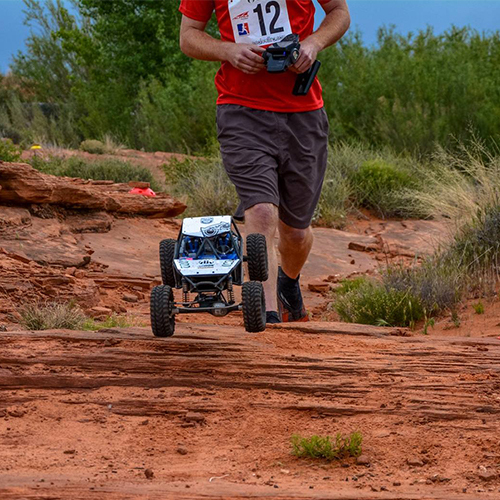 AZU4RC is Arizona’s Premier U4 Rock Racing Club. 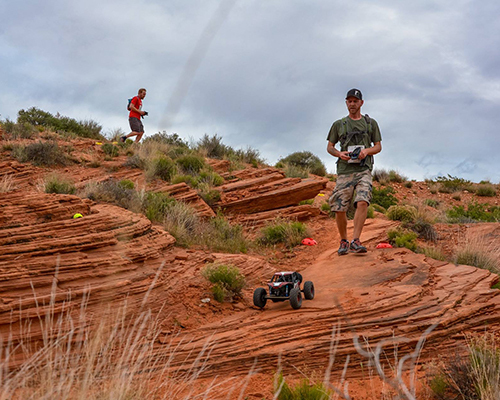 Utilizing R/C rigs such as the AXIAL Wraith, Yeti, Bomber, and SCX10 platform from stock to fully built. This year AZU4RC hosted the largest U4 Nationals Race Event ever held. 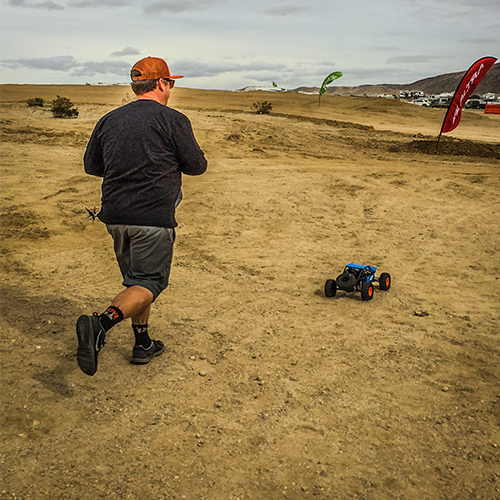 With well over 100 entries, and like minded off-road R/C fans from all over the US traveled to battle it out on our world class track layout built by the best, Joey From ” The Dirt” who build’s tracks for some of the largest 1/8th scale events in the world. Our focus at AZU4RC is to build a fun, family, friendly place for all skill levels. Basically anyone who has a blast playing with toy cars will love our club. We even have beginner classes if your just starting. You will find our club to be full of people willing to lend a hand or pass along a tip or two. 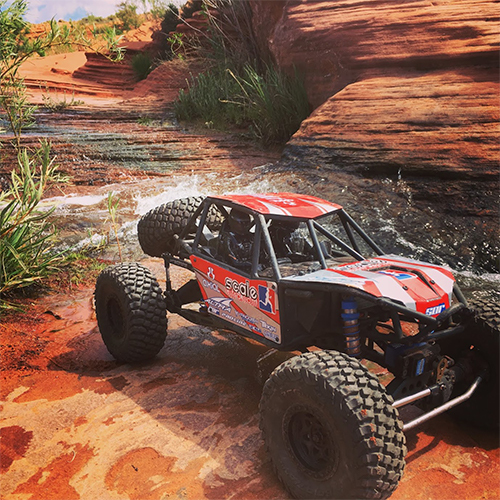 AZU4RC is fun for many reasons; It tests your cars durability to finish a race and your skills to navigate the 1:1 Ultra 4 Racing inspired courses obstacle’s with a bit of short course flavor to add speed and excitement. In addition to hosting the biggest Nationals event, we have the ultimate test of car and driver at the “30 min Endurance Race”. Hope to see you there! The entire off-road community mourns this week after learning of the loss of one of the most iconic names in the desert, Bob “Weatherman” Steinberger. It all started in the mid 70′s when Bob went off road racing with a few buddies. Waiting on race cars without communication was a problem Bob set out to fix. Hoisting an antenna 175′ in the air from a weather balloon, he set up the first relay station, allowing competitors to get valuable information to their teams and vice versa. Some 40 years later, Bob would still climb to the top of Diablo peak, 10,000′ off the deck on the Baja peninsula, and serve the entire community with information to let teams know where their race cars are as well as primary communications for emergencies. This man dedicated himself to helping everyone he could, he was a gentleman to the end, on and off the track. He will be missed by all, including Richard Cranium. for AXIALFEST 2017! sPod (power distribution systems) as been an official technical partner of Axial’s since the introduction of the AX90028 SCX10™ 2012 Jeep® Wrangler Unlimited Rubicon 1/10th Scale Electric 4WD – RTR. The innovator and the FIRST power distribution system engineered / designed for offroad vehicles. Precision Designs, LLC (DBA sPOD) has been in business since 2006 with our first systems designed and manufactured for Jeep TJ Wranglers. We are a small family owned and operated business based in southern California. Our equipment is 100% made, assembled and shipped in the United States. We have our ISO 9001:2008 certified quality program in place in order to produce the highest quality power distribution systems on the market. Every single system is bench tested as a unit as the customer ordered it. Our complete systems range from $363 – $750. We manufacture products for: (but not limited to) Jeeps, Trucks, Vans, Race vehicles, Utility trucks, Emergency vehicles, Farm – Agriculture equipment, Armored vehicles, Trailers, RV’s and even Boats!